Most people know that eating fruits and vegetables is important for good health, but most of us still aren’t getting enough. 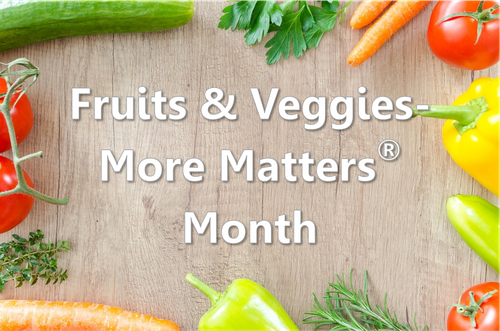 This September, Annie’s Apothecary is proud to participate in Fruits & Veggies – More Matters Month. Unfortunately, more than 90% of both adults and children do not eat the recommended amount of fruits and vegetables. But it doesn’t have to be hard. Including more fruits and vegetables throughout your day can be really easy and delicious. You can try a new fresh, frozen, or canned fruit or vegetable each day. Make it fun for you and your kids by trying new recipes and having them select what fruit or vegetable they want to try. By making healthy choices you are serving as a great role model for your kids and will be teaching them to make healthy choices everyday too. Keep a bowl of fruit handy where the whole family can see it. Challenge your family to try a new veggie or fruit every week. Programs are forming in some of our local schools called “Let’s move salad bars to schools” so every child has the choice of healthy fruits and vegetables every day at school. Support your local community by visiting your farmers markets to get fresh, seasonal fruits and vegetables that your family can enjoy. You can also join America’s more matters pledge to fight obesity by eating fruits and veggies today and everyday!